Marine Corps Air Station Iwakuni is located in Iwakuni, Yamaguchi, Japan, approximately 600 miles southwest of Tokyo. The base is home to Marine Aircraft Group 12 which flies the F/A-18 Hornet, the KC-130J and the MH-60S Helicopter. The mission at Iwakuni is to provide air support to Marine units stationed throughout the Asia-Pacific Region. One of Japan's largest air shows is hosted every year on May 5th from MCAS Iwakuni during Friendship Day - an event celebrating the long-standing friendship of Japan and the United States. 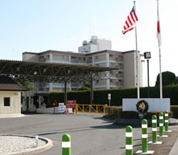 This MCAS Iwakuni directory features the critical info you'll need to navigate through the many facilities and recreational opportunities available on base.